Inside on the rear waistline is a “TIM McAULIFFE” manufacturer’s tag. Adjacent are two white felt strip tags. 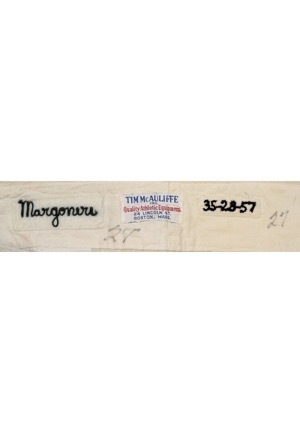 One reads the player name, “Margoneri” and the other reads, “35-28-57”. Both are embroidered with black chain-stitching. The number “27” is written adjacent to these tags in black pen in two different sports. 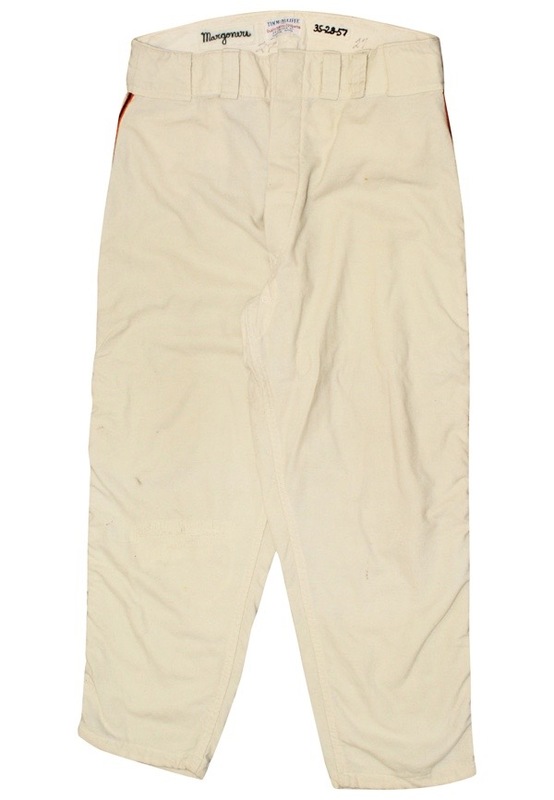 The piping down each pant leg is done in black and orange stitching. These pants are properly tagged, were presented to us as game-used and in our opinion, show appropriate use. Accompanied by an LOA from our consignor stating how the pants were acquired. To generate press for Cheney Stadium in Tacoma, WA., buyers for Bon Marché department stores were asked to wear Giants uniforms in the store to generate press. The Giants sent a box of old uniforms, which were handed down from the pro level club from years prior.